Avast! Pro Antivirus 2019 is avast! 's latest commercial malware-hunting engine. Installation is simple and straightforward. Compatibility seems good, too, with the package running happily alongside Norton Internet Security on our test PC. The program interface is clean and very easy to use. 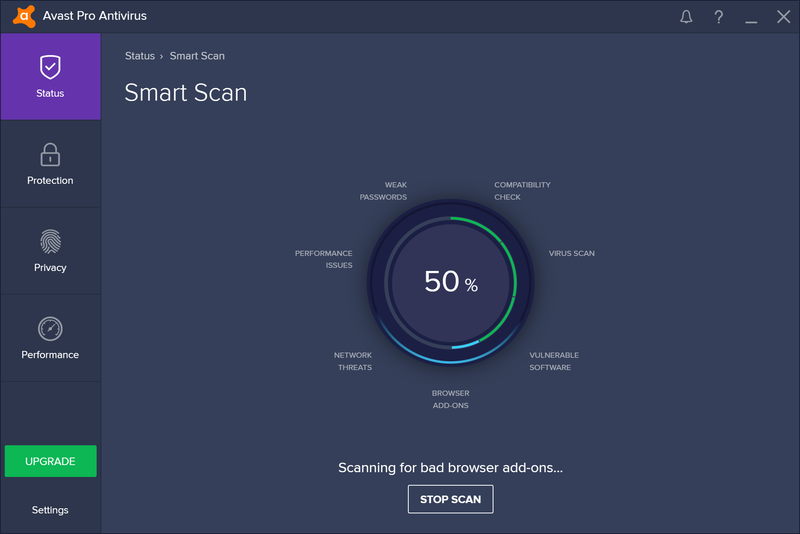 Just click "Smart Scan" and Avast immediately runs a quick check for malware. But it now also scans for missing software updates, runs a new Home Security Network Check (wifi status, weak router passwords etc), and even looks for junk files and poorly configured Windows settings. If you're in a hurry then you can click "Resolve all" and leave the program to sort out the details. But if you need more control then Avast! Pro Antivirus 2018 has plenty to offer. For example, the antivirus engine can check individual files, folders, removable media, commonly infected areas of your PC or the entire system. If that's not enough, you're able to create your own custom scan type by tweaking 30+ settings. And this can be scheduled to run at boot time, daily, weekly, monthly - whenever you like. The 2019 version can also scan TLS/SSL protected traffic, detecting threats even on HTTPS connections. Avast DeepScreen now uses hardware virtualisation to run processes in standalone virtual machines, completely isolated from the rest of your system, improving security and detection (you'll need hardware virtualisation to be supported and enabled, of course). Help has moved completely online, where it's both more complete and more up-to-date. Of course there's the usual round of bug fixing, too, which this time reportedly involves "a lot of stability & performance changes in all components". If you're an Avast! Free Antivirus user, why not move up to the commercial Pro edition using this special offer?